Rep. Joaquin Castro (D., Texas) has announced that he will not run for the seat held by Texas Sen. Ted Cruz (R.) in the upcoming 2018 election. Castro's decision leaves his colleague Rep. Beto O'Rourke (D., Texas) as the only likely Democrat to challenge Cruz, Politico reported Monday. In a Facebook post titled "My Decision on the Senate Race," Castro wrote, "Texans want a senator who will stand up for their families, not stand down to Donald Trump." 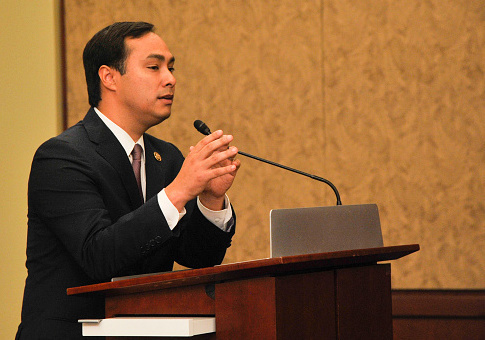 Castro explained that because of national security threats and "reckless behavior" from President Trump's administration, he believes he can best serve by focusing on his duties as a member of the House Foreign Affairs and Intelligence committees. "I've kept my pledge to fight for hard-working Texans, and I'll keep doing that," Castro wrote. "However, with the threats posed by Russia and North Korea, coupled with the reckless behavior of this administration and their failure to invest in economic opportunity for the American people, at this time I believe I can best continue that work by focusing on my duties in the House Foreign Affairs and Intelligence Committees." But Castro appeared to leave the door open for a possible future run. "Our work is just getting started. I'll keep traveling this state to help any candidate for any office who is willing to stand up for Texas and create a brighter future for all Americans," he wrote. This entry was posted in Politics and tagged 2018 Election, Joaquin Castro, Ted Cruz. Bookmark the permalink.